Festival Pontiac Enchanté has a showcase of young classical musicians and seasoned professional from Ottawa and around the world. These concerts will be held at Venturing Hills farm on various dates in July and August. Half of the profits will go to the Pontiac Equestrian Association. Those interested may contact Sheila McCrindle, at 819 319-9633 or by email (sheila@demetercatering.ca). 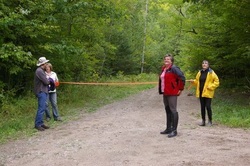 The development of the horse trail in Luskville (in the Gatineau Park) is made possible by wonderful volunteers who graciously give of their time to the cause. A lot of sweat and work in involved in maintaining the existing section and in developing new trails. Volunteer meet during summer to but branches, build bridges, clean up the trail and secure future sections.